November 3, 2009 – Separated at Birth – Balloon Boy, 'V' and Mr. Spock! 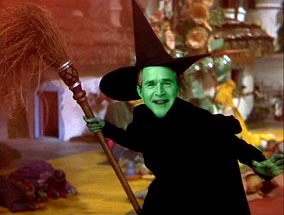 The Wicked Witch Is Dead! Long Live the Munchkins! Although it is far too early to estimate the kind of impact that President-elect Barack Obama will have, I am very excited about his victory for a number of reasons. First of all, to be finally, finally rid of the Bush/Clinton stranglehold that has been wrapped around the neck this country for the last 28 years (and you could even go as far back as the last 70 years to the days of grandfather Prescott Bush), is an absolutely fantastic development! That alone is a major positive step forward for America. Obviously, Hilary Clinton was the ideal choice of the elites from the outset of the 2008 campaign and it was astonishing to witness how quickly that plan completely disintegrated. John McCain became their second best option, but when he foolishly chose Sarah Palin as his running mate, the Republicans were all but assured to lose. The only question that remained was by how much. Secondly, it appears that, with the defeat of both McCain and Clinton, the Neo-Con/War on Terror agenda has been dealt a serious blow, if not its death knell. The Neo-Cons have been pushing hard to bring on their New World Order in the hopes of widening the war in the Middle East, locking down their fascist game-plan in this country and accelerating the North American Union by collapsing the US economy. It would seem that with Obama's victory, there has been a major paradigm shift of epic proportions, and all of those hideous plans have been derailed for good! Thirdly, there is now a tremendous opportunity for optimism and positivity to unfold regarding the future of this nation and, indeed, the world, as never before. We are sitting on the cusp of some monumental and dynamic changes on our planet and one of the major roadblocks to those changes is crumbling away before our very eyes. Although admittedly, a more ideal candidate would have been either a Ron Paul or a Dennis Kucinich or even, a (Libertarian Candidate) Bob Barr, there remains a lot of concern about Obama, due to his highly questionable voting record while serving as s US Senate from Illinois. And those concerns are extremely valid. Nonetheless, it is important to understand the big picture here. The world is rapidly transforming itself towards a major shift in consciousness and awakening. The momentum is like a freight train rumbling down the tracks that has lost its brakes. NOTHNG is going to stop this from happening. And with this acceleration of transformation, we are creating that emerging new world through our own thoughts, and our own feelings, with more power than ever before. The very fact that Obama, was able to win, signals there are big changes in the air. Now is not the time for further pessimism. We are about to clear out eight years of a war OF terror waged upon the American people by the Neo-Cons. Now their time in the sun is done! Now is not the time to worry and fret about how things could possibly further deteriorate under Obama's watch. Rather, we must see this as the time to focus on all the positive changes and transformations that are within the hopes and desires of the people, and believe that Obama will be on board with most of it. Obama's victory also continues the mandate set forth by the American people that began in earnest during the 2004 election of rejecting the Neo-Cons outright! The voters clearly demanded that Congress bring an end to the Iraq war so they threw a lot of the Republicans out of office. Unfortunately, much to their horror, the American people realized the Democrats were just as bad. Now, the voters have become hoping mad with this so-called "bailout bill" fiasco and it was reflected in how they cast their ballots in this year's election. So the sleeping giant has awoken and its attention has been grabbed. These are yet more positive signs that a major transformation is occurring within the people. And that's really what matters most. And fourth and finally, perhaps, the best news of all. Maybe you may have felt something similar occur within you this past week. But I have sensed this huge shift away from being concerned about any kind of dire terrorist, political, social or economic event of a negative, cataclysmic nature taking place. I have felt an enormous sense of relief that we have reached an ending to a chapter. It is entirely likely that have now passed through the worst part of this transition during the year 2008. We have endured 9/11, the War on Terror, two immoral and illegal wars, domestic spying, civil liberties erosion, a catastrophic economic crisis, and much, much more. Now it is time to focus on cleaning up this mess and healing ourselves and the planet. If we continue to dwell on how evil and bad the government, or, an Obama administration can become we will create that kind of a future. Begin now to feel the excitement of change and anticipation that is not only percolating in this country, and throughout the entire world, most of which is equally thrilled with Obama's victory. The Wicked Witch is nearly dead! Just as in the classic movie, "The Wizard of Oz," when a bucket of cold water was dumped upon the Wicked Witch of the West, she begin to literally melt away. And that is precisely what we are seeing occur within the ranks of the Neo-Cons and New World Order agenda. Only in this instance, the bucket of cold water was their failure to put their candidate of choice into office for this vital Presidential election. Obama is a wild card and appears not to be in the elite's pockets for now, as most of his predecessors have been since John F. Kennedy. We must trust there is a purpose, a Divine purpose, if you will, why Obama has been designated as the next President of this great country leading up to the monumental year of 2012. 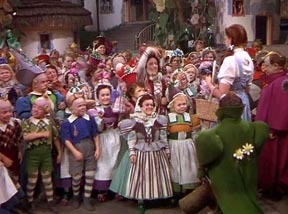 And we little Munchkins, who are the meek who shall inherit the Earth, have now arrived at our moment to shine. We can see now begin to see Golden Age looming on the horizon, like a beacon in a sea of lost hopes, or, like the proverbial Emerald City among the poppie fields. However, ultimately, this major shift that will unfold in this world, will not come from any political leader, or any government, or any policy, or any plan, or any revolution, or even, any spiritual figure, but rather, it will come from within YOU! And that is what will make the most difference in our or, more profoundly, in your world.